I will insist particularly upon the following fact, which seems to me quite important and beyond the phenomena which one could expect to observe: The same [double sulfate of uranium and potassium] crystalline crusts, arranged the same way [as reported to the French academy on 24 Feb 1896] with respect to the photographic plates, in the same conditions and through the same screens, but sheltered from the excitation of incident rays and kept in darkness, still produce the same photographic images … [when kept from 26 Feb 1896] in the darkness of a bureau drawer. … I developed the photographic plates on the 1st of March, expecting to find the images very weak. Instead the silhouettes appeared with great intensity. Read at French Academy of Science (2 Mar 1896). In Comptes Rendus (1896), 122, 501. As translated by Carmen Giunta on the Classic Chemistry web site. Just think of the differences today. A young person gets interested in chemistry and is given a chemical set. But it doesn't contain potassium cyanide. It doesn't even contain copper sulfate or anything else interesting because all the interesting chemicals are considered dangerous substances. Therefore, these budding young chemists don't get a chance to do anything engrossing with their chemistry sets. As I look back, I think it is pretty remarkable that Mr. Ziegler, this friend of the family, would have so easily turned over one-third of an ounce of potassium cyanide to me, an eleven-year-old boy. 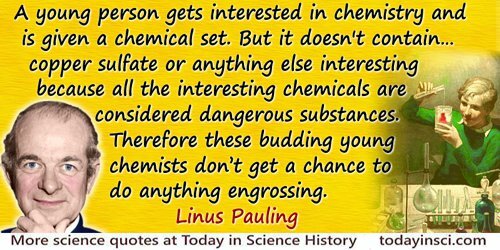 In Barbara Marinacci, Linus Pauling In His Own Words (1995), 29. When Oxygen and Potassium went on a date, it went OK.
[Concerning] phosphorescent bodies, and in particular to uranium salts whose phosphorescence has a very brief duration. With the double sulfate of uranium and potassium ... I was able to perform the following experiment: One wraps a Lumière photographic plate with a bromide emulsion in two sheets of very thick black paper, such that the plate does not become clouded upon being exposed to the sun for a day. One places on the sheet of paper, on the outside, a slab of the phosphorescent substance, and one exposes the whole to the sun for several hours. When one then develops the photographic plate, one recognizes that the silhouette of the phosphorescent substance appears in black on the negative. If one places between the phosphorescent substance and the paper a piece of money or a metal screen pierced with a cut-out design, one sees the image of these objects appear on the negative. One can repeat the same experiments placing a thin pane of glass between the phosphorescent substance and the paper, which excludes the possibility of chemical action due to vapors which might emanate from the substance when heated by the sun's rays. One must conclude from these experiments that the phosphorescent substance in question emits rays which pass through the opaque paper and reduces silver salts. Read at French Academy of Science (24 Feb 1896). In Comptes Rendus (1896), 122, 420. As translated by Carmen Giunta on the Classic Chemistry web site. [Davy's] March of Glory, which he has run for the last six weeks—within which time by the aid and application of his own great discovery, of the identity of electricity and chemical attractions, he has placed all the elements and all their inanimate combinations in the power of man; having decomposed both the Alkalies, and three of the Earths, discovered as the base of the Alkalies a new metal... Davy supposes there is only one power in the world of the senses; which in particles acts as chemical attractions, in specific masses as electricity, & on matter in general, as planetary Gravitation... when this has been proved, it will then only remain to resolve this into some Law of vital Intellect—and all human knowledge will be Science and Metaphysics the only Science. In November 1807 Davy gave his famous Second Bakerian Lecture at the Royal Society, in which he used Voltaic batteries to “decompose, isolate and name” several new chemical elements, notably sodium and potassium. Letter to Dorothy Wordsworth, 24 November 1807. In Earl Leslie Griggs (ed. ), The Collected Letters of Samuel Taylor Coleridge (1956), Vol. 3, 38.